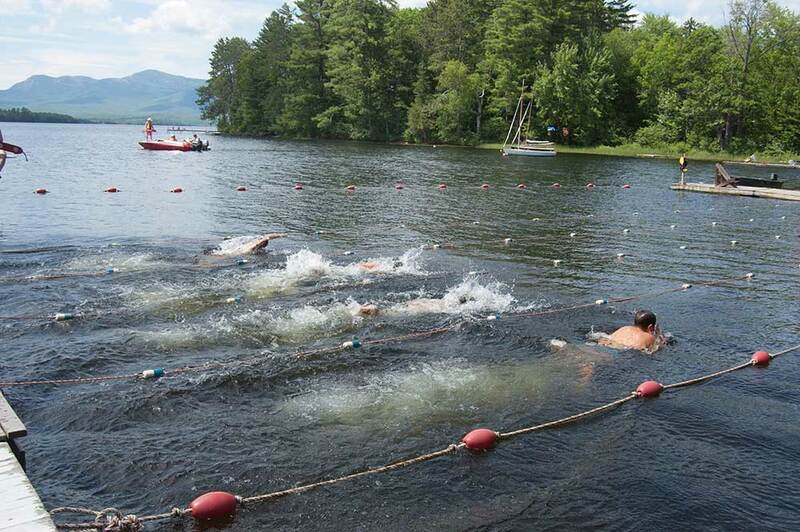 Webb Lake, fed by natural springs and mountain streams, provides an inviting place to boat and swim. The Kawanhee campus is arced around a cove that is home to Kawanhee’s swimming program. The cove is a busy hub, especially on warm July days, and offers a sandy beach and a dedicated swimming area, defined by docks, a floating safety line and several lifeguard stations. 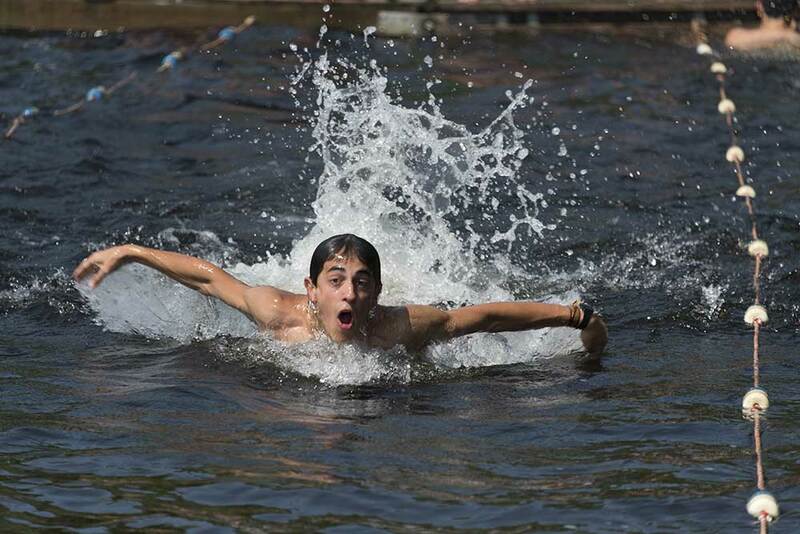 During the first full day of camp, each boy will be evaluated for his swimming ability. Some will do the Lake Swim, a distance of a quarter mile; others will tackle a shorter distance. Endurance and stroke proficiency will be assessed, and those who could use additional instruction will be identified. 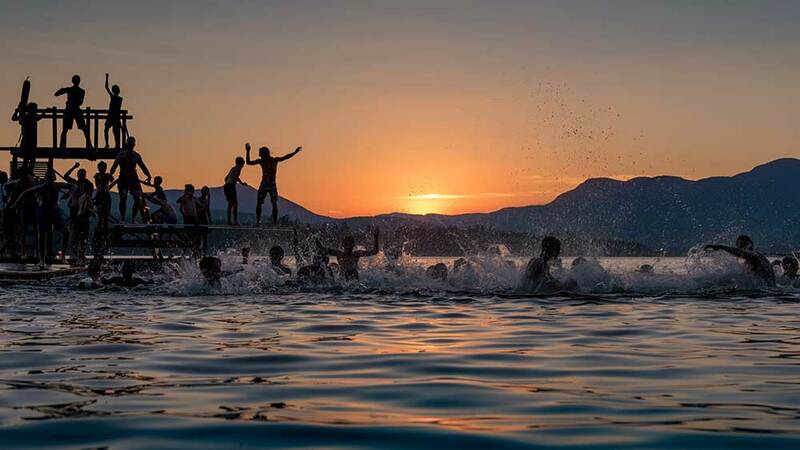 Given the number of aquatic activities offered, the ability to swim comfortably is important. Those who need work in this area will be encouraged to spend more time with swimming instruction during activity periods. “Free swims” are typically offered at least twice per day. Safety protocols are carefully observed by both campers and swimming staff. Kawanhee also offers Red Cross certification in Lifeguard Training (“LGT”) for boys at least fifteen years of age. Graduates of the LGT class become certified lifeguards, an ambitious achievement that can create great job opportunities back home. For some campers, there’s nothing more exhilarating than skippering a sailboat in a stiff breeze and reckoning with the challenges of maintaining a full sail. Our sailing program is fortunate to have an impressive variety of boats to suit the needs and interests of sailors of all ages. 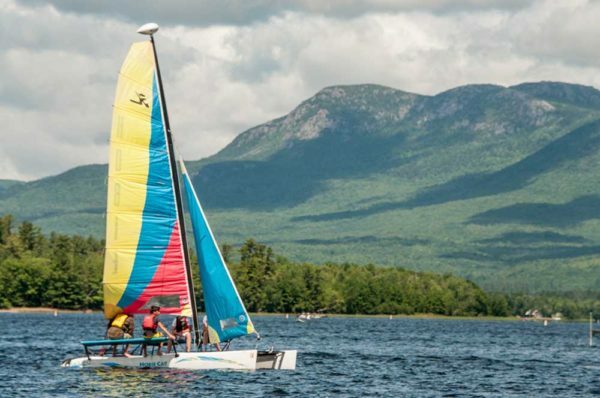 We have antique wooden Cape Cod knockabouts, fiberglass Sunfish, a Hobie Cat catamaran and a fleet of Flying Junior racing dinghies, among others. Some guys love to sail just to be out on the water, letting Mother Nature do the work. 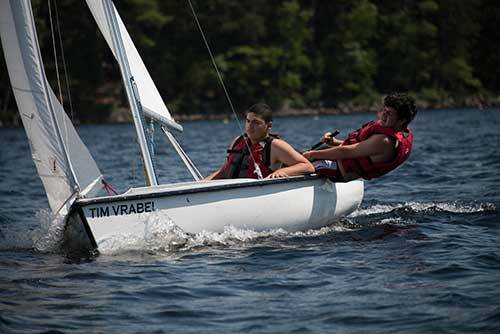 Others prefer competitive racing and look forward to regattas offered throughout the summer. Instructional time is spent to develop a camper’s skills, beginning with basic terms and knots, progressing to rigging a boat, learning wind behavior and sailing theory, serving as a crew member to a more accomplished sailor, and eventually to sailing one’s own craft in all kinds of wind conditions. For those who have demonstrated proficiency, taking a sail during free time, within view of an assigned beach guard, is an option. Life jackets are required for all sailors. Kawanhee’s 16 foot ski boat with its 115 hp. 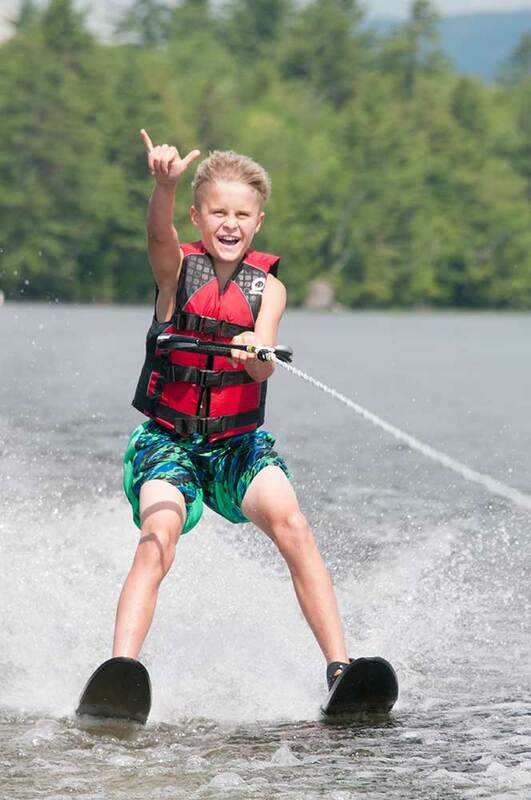 motor makes for thrilling experiences for all age skiers. Our instructors have had several years of experience, and patiently encourage the new learners. All skiers must wear life vests. The campers themselves voted skiing one of the most popular activities in camp. 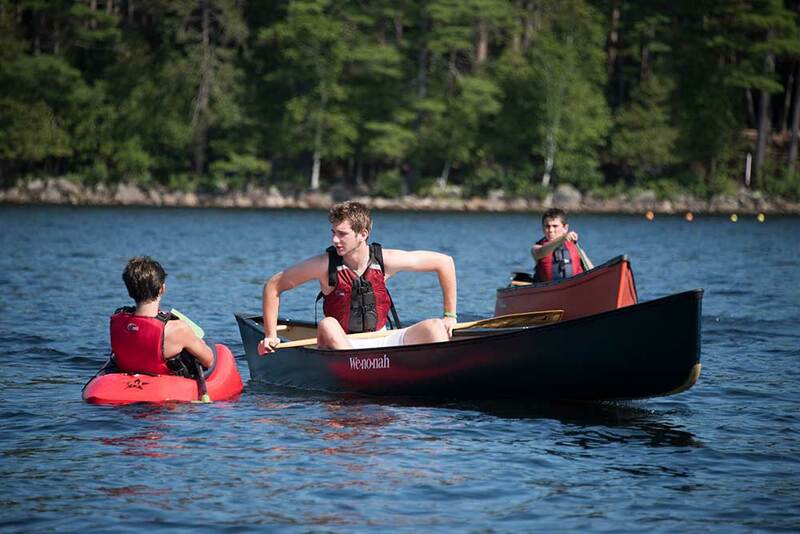 The handling of a canoe is a traditional art that receives plenty of attention at camp. Our canoeing counselors teach campers essential skills, including the “J” stroke, the draw, the pry, the sweep, the reverse sweep, poling and rescues. 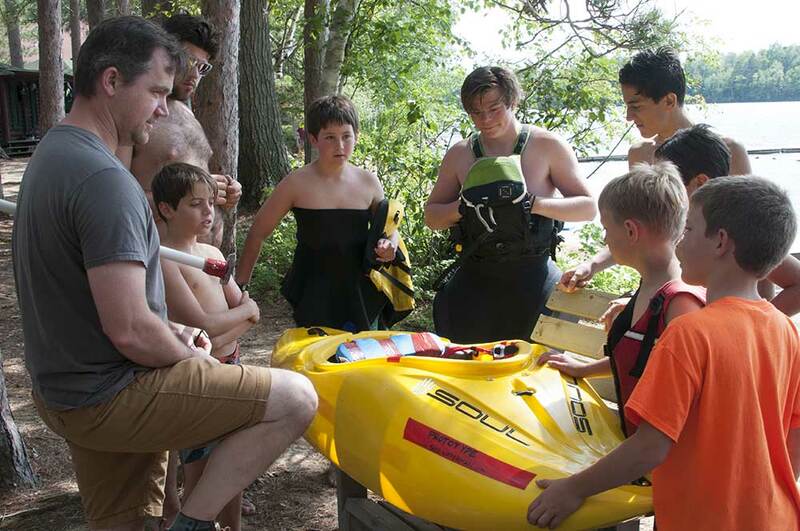 Once boys are comfortable on flat water, they are eligible to partake in river trips, where Class II rapids offer the chance to learn about hydraulics, eddies, ferrying and river rescues. Our older guys have the option of spending several days on the storied Allagash River, a remote wilderness waterway in northern Maine. Our counselors pack satellite phones when taking campers to such remote places. 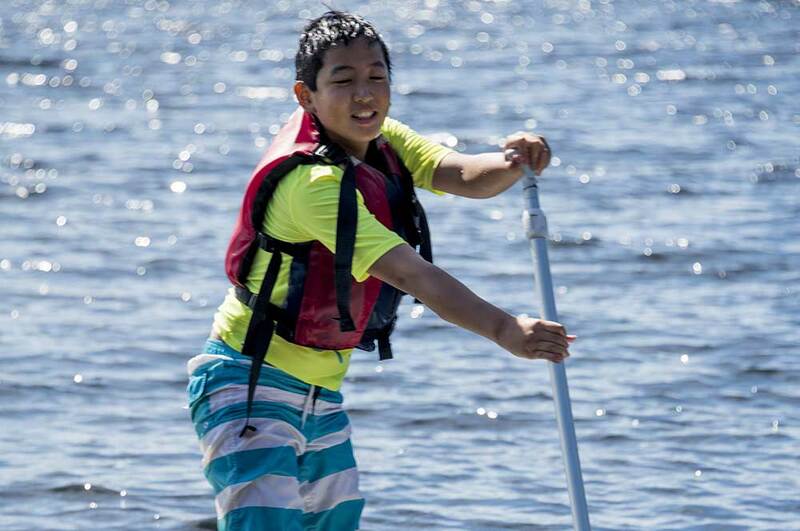 Canoeing’s place in Kawanhee’s culture is reinforced by the canoe paddle each boy receives during his first summer at camp. 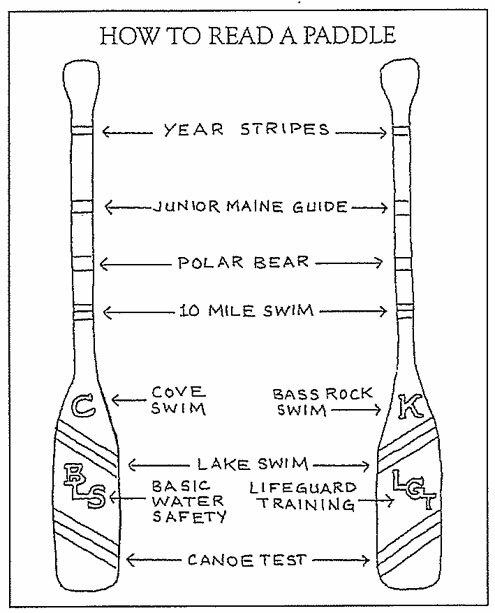 During a boy’s camp years, the paddle serves as a symbol of his significant accomplishments, aquatic and otherwise. With each achievement designated as paddle-worthy, a particular emblem is painted on a camper’s paddle. These paddles are seldom used in a canoe; more often, they adorn a boy’s bedroom back home as a reminder of jobs well-done. For many years Kawanhee kayakers have been gracing the Kawanhee cove with their powerful forward strokes, their elegant sweep strokes and braces, and their acrobatic Eskimo rolls. 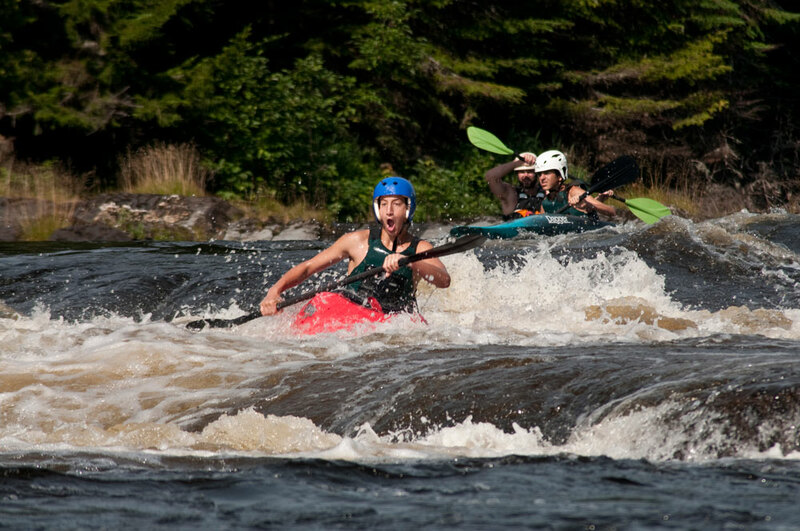 Once campers develop reliable kayaking skills and feel comfortable with capsizing, they are eligible to take their kayaking skills to Class 2 rapids on nearby rivers under the supervision of our kayak instructors. The older, more advanced paddlers can test their skills on Class 3 water. Only in current can kayakers learn about hydraulics, using eddies to enjoy the river at one’s own pace, ferrying, surfing, and other delights. Paddleboarding is all the rage recently, and Kawanhee’s collection of boards is expanding each year, as is camper demand for the activity.